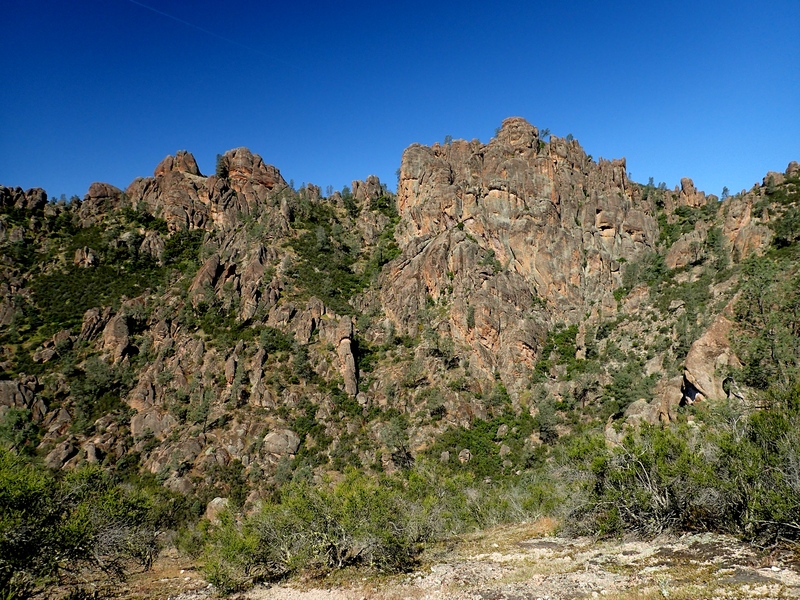 In the early 1970s, I was a frequent visitor to the west side of Pinnacles National Park (it was a national monument then) both for rock climbing and to spend time with friends who were then rangers at Chaparral. 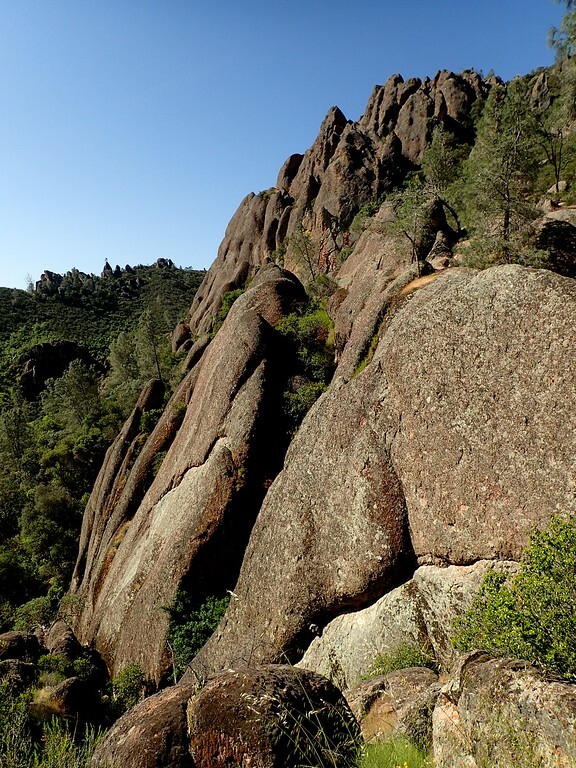 Some of my earliest rock climbs were done on the loose, crackless, downward sloping volcanic breccia that dubiously passes for “rock” at Pinnacles. I never made it over to the east side then and haven’t been back since. The LovedOne had never been there. 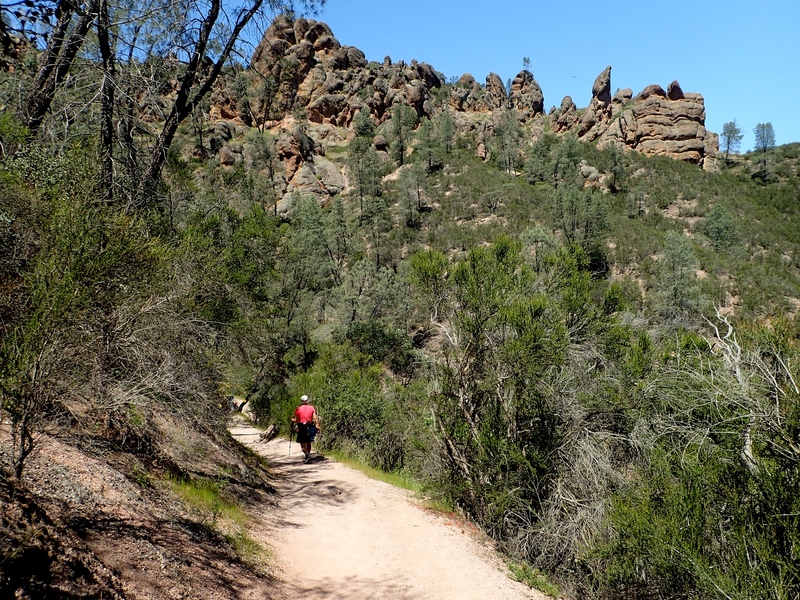 So, after another night in Gilroy, California (“The Garlic Capital of the World”), we drove south to explore – for the fifth hike in our week of wandering the Golden State – the east side of Pinnacles. 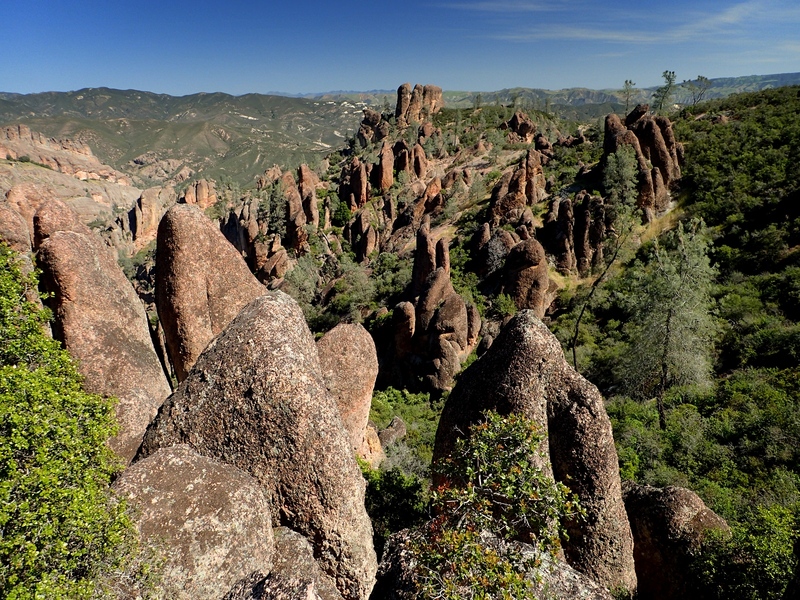 Thanks to the efforts of an early homesteader, Schuyler Hain, Pinnacles was established by President Theodore Roosevelt in 1908 as a 2,500 acre national monument. Since then, the monument has increased in bits and pieces to its present size of about 26,000 acres. 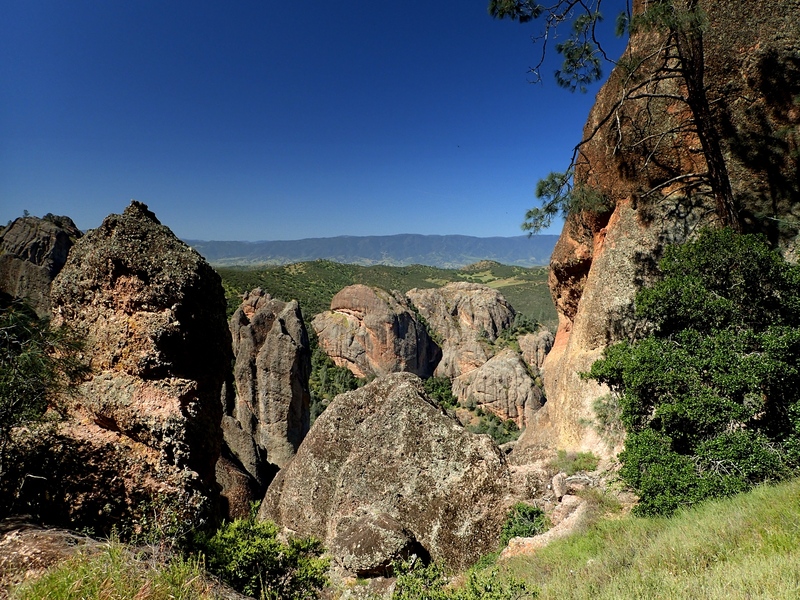 In 2013 President Barack Obama signed legislation passed by Congress that redesignated the monument as a National Park. 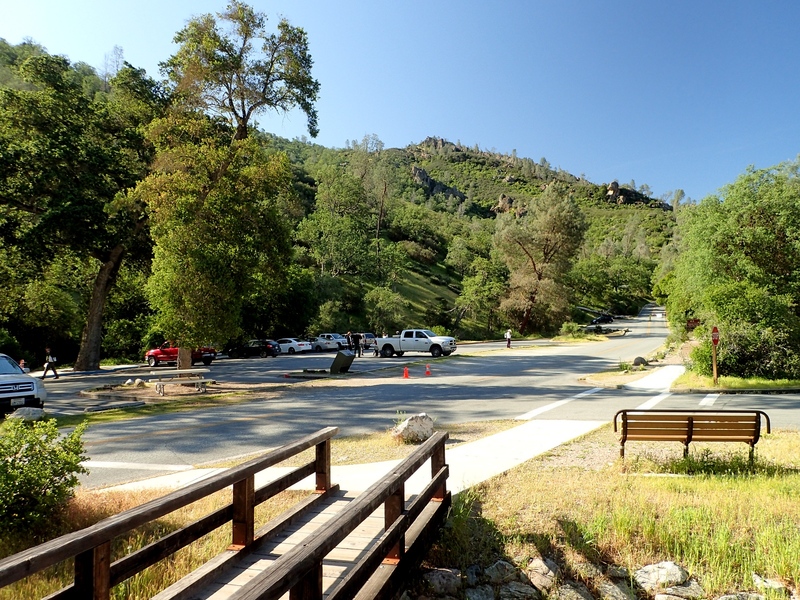 We got our usual early start and, after a one hour drive from Gilroy, arrived at the Bear Gulch parking lot when it was still mostly empty (that would change by the time we returned). 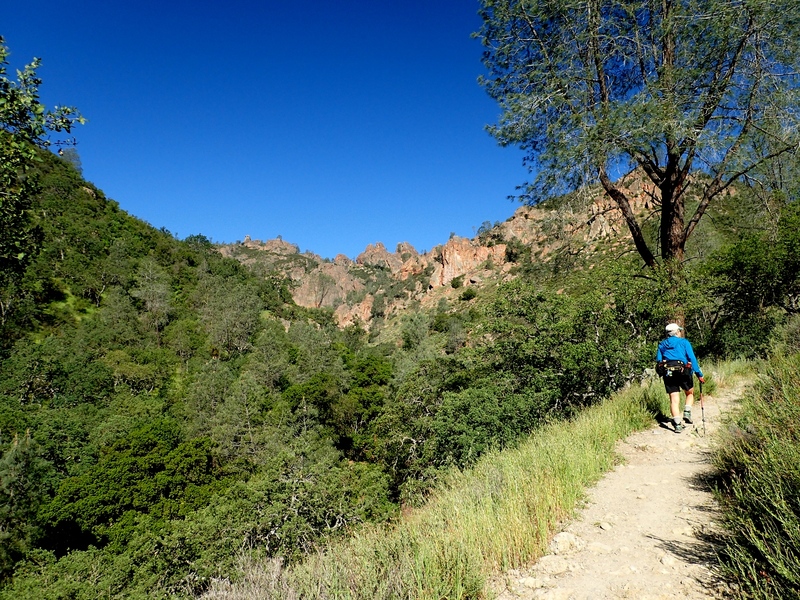 From there, we started up the Condor Gulch Trail in the cool of what would prove to be a sunny, cloudless day that had warmed into the 80ºFs by the time we got back to the car. we could look down for flowers along the trail. 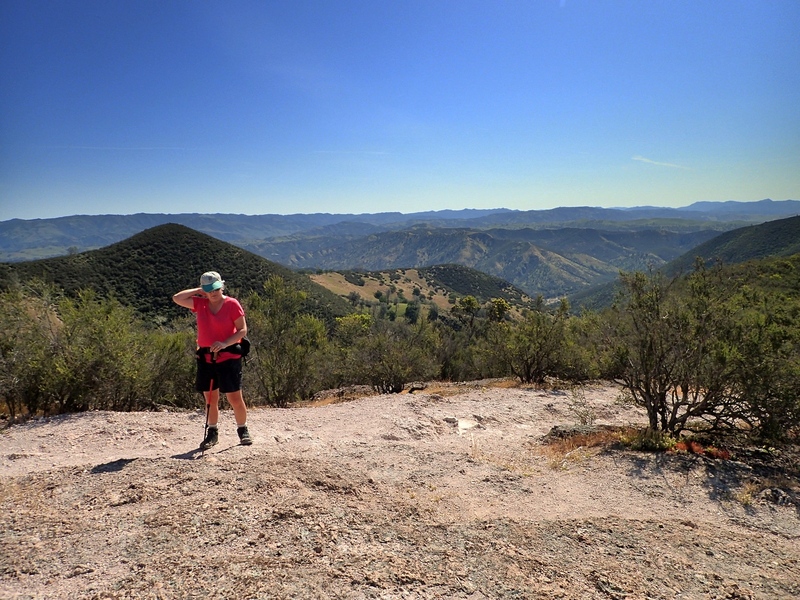 to where, 1.7 miles from the trailhead, it reached a junction with the High Peaks Trail, with a wide view out across the cloudless eastern horizon. 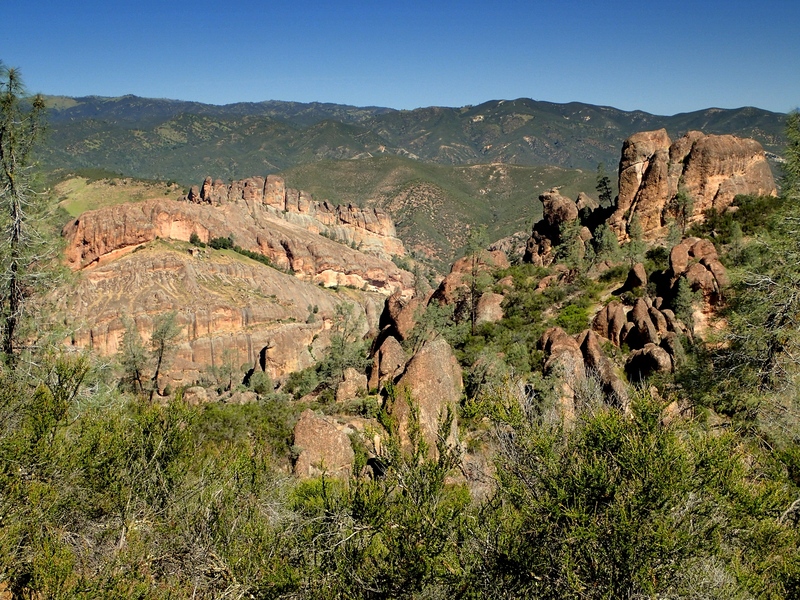 From here, we could look north toward the rock formations in the Park’s Balconies and Machete Ridge areas. From here we went west on the High Peaks Trail as it began circling around the north and west sides of Hawkins Peak. 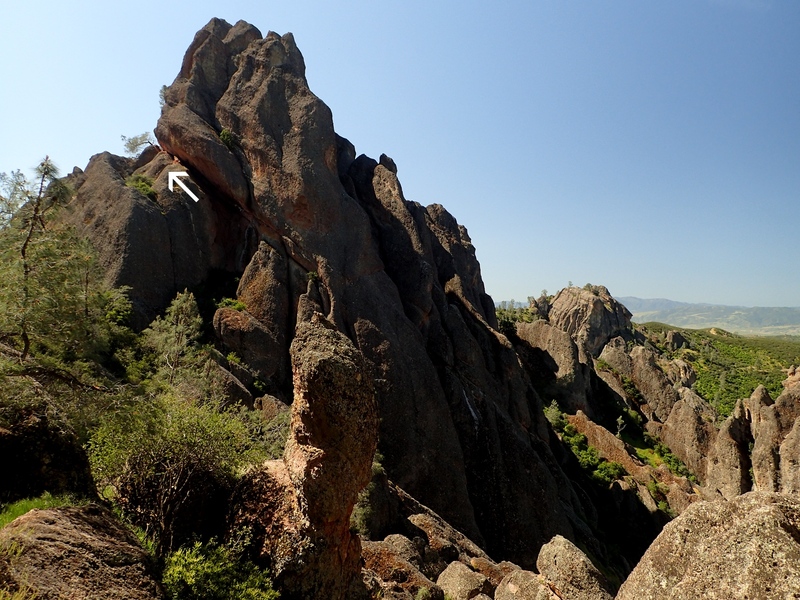 We were essentially following a ridge through a variety of amazing rock formations. By now the sun was well up and the cool of the morning was starting to give way to a bright warmth that we hadn’t felt while hiking during the past several months (heck, we’d hardly even seen the sun for several months!). This warmth felt really, really good! 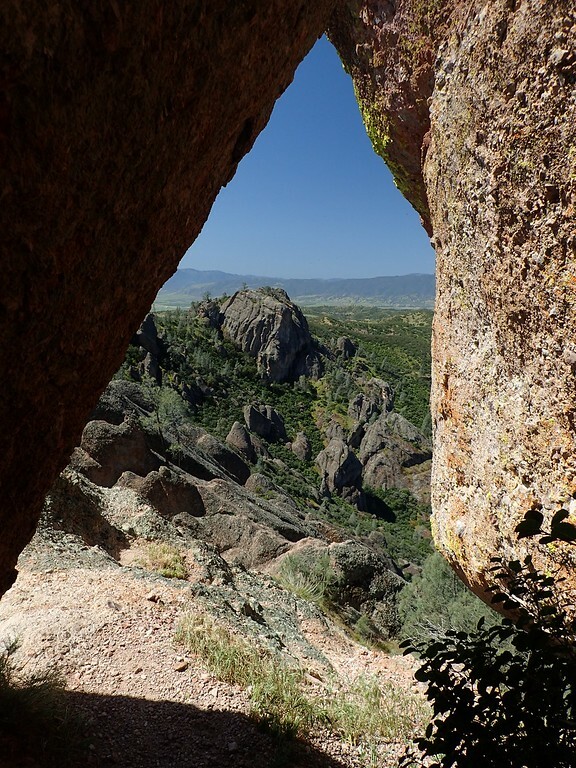 As we followed the trail around to the west side of Hawkins Peak, we could get a view to the west of the Chaparral area and the rock formation known as The Fingers. 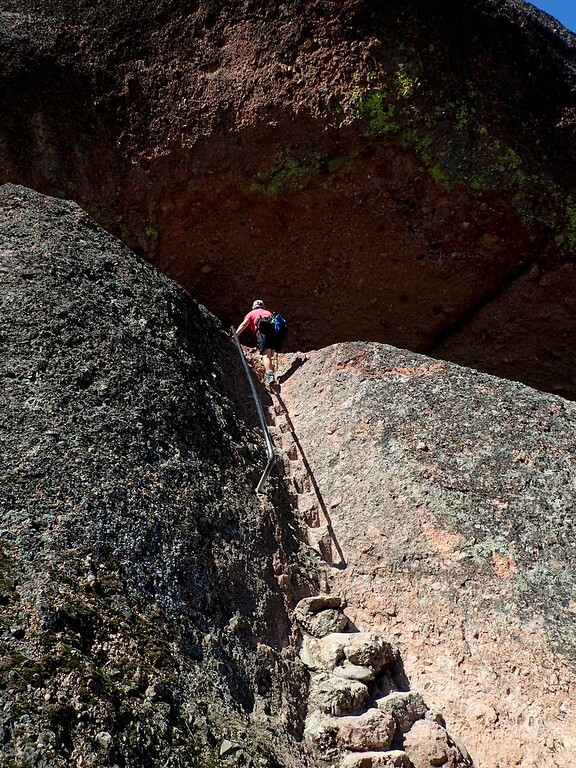 We stopped for a snack near a little sign that said we were coming to some “steep and narrow” sections. Looking up from where we were snacking, I could see what looked like a glint of metal high on the rock formation ahead. 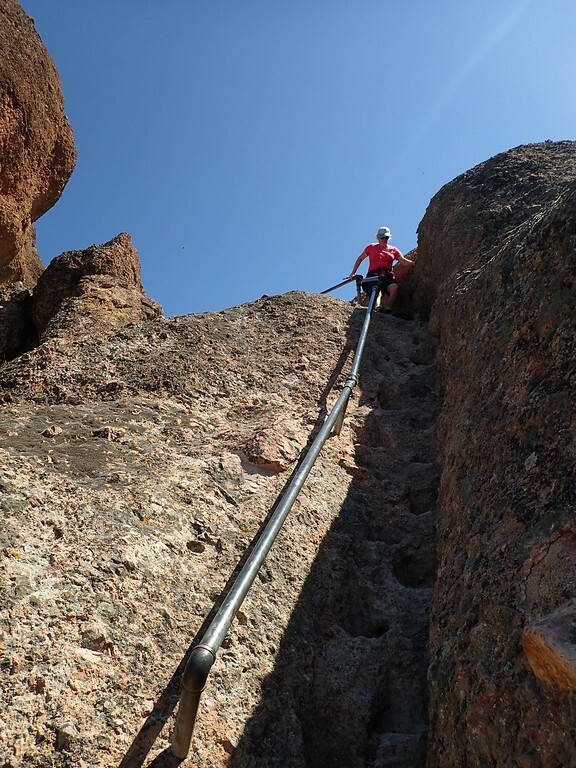 Soon we would discover that this was one of the handrails on the “steep and narrow” section. 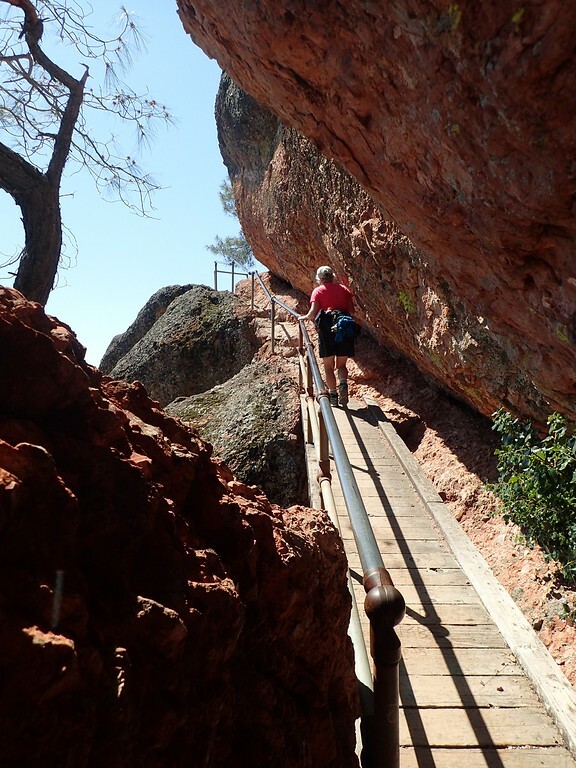 Soon we came to the base of a steep staircase (with handrail) that was hewn in the rock by Civilian Conservation Corps (CCC) workers before World War II. 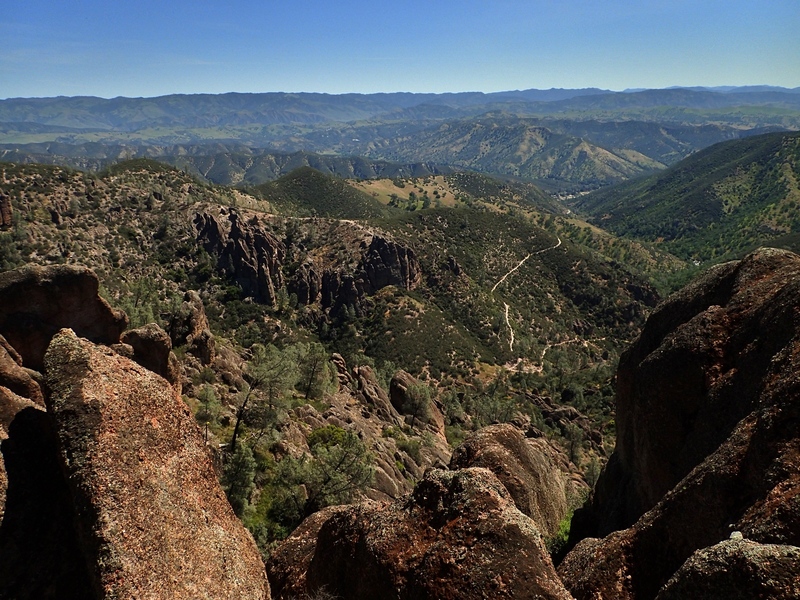 with a great view directly down into Condor Gulch. another staircase took us down to the south side of Hawkins Peak. Negotiating these classic CCC stairs and handrails was not particularly hard (as long as I remembered to duck) but was a huge amount of fun! A really nice break from just walking on a flat trail. 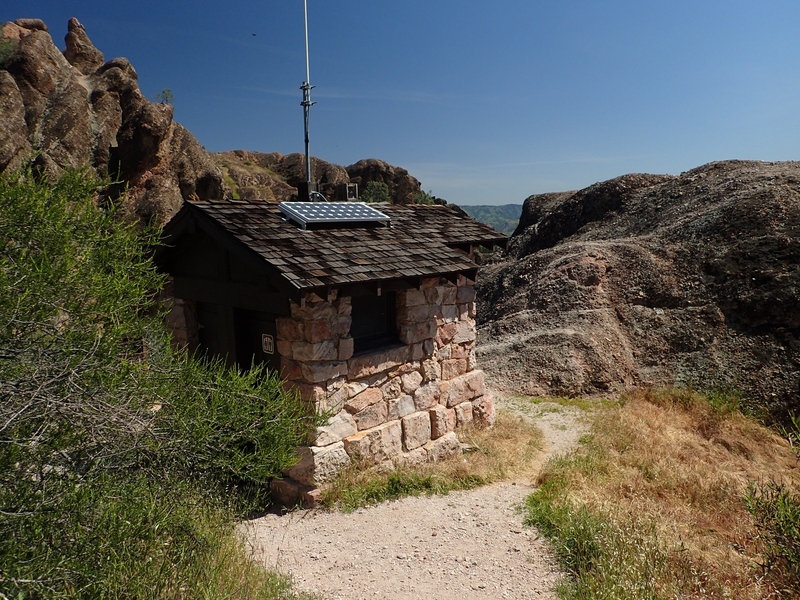 We ambled a little further along the now flat High Peaks Trail to enjoy the amenity (rock restroom) at the junction of the High Peaks and Juniper Canyon Trails. 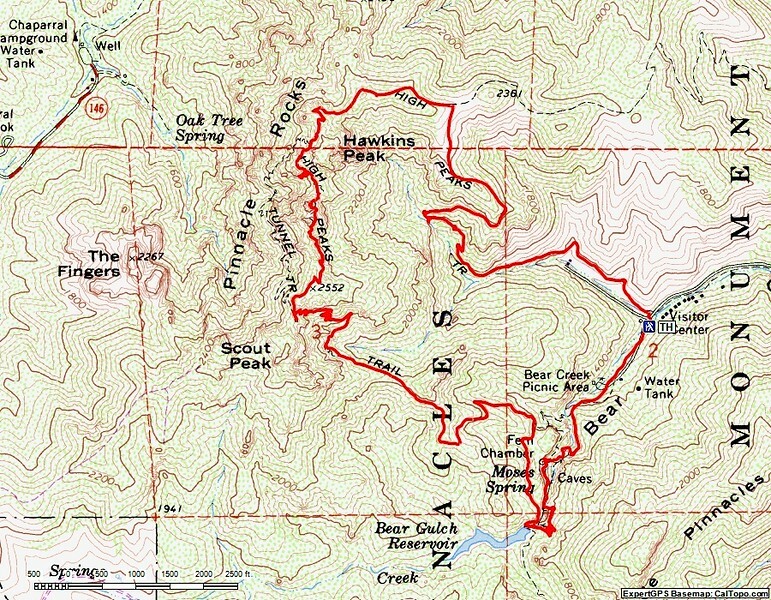 toward its junction with the Rim Trail. 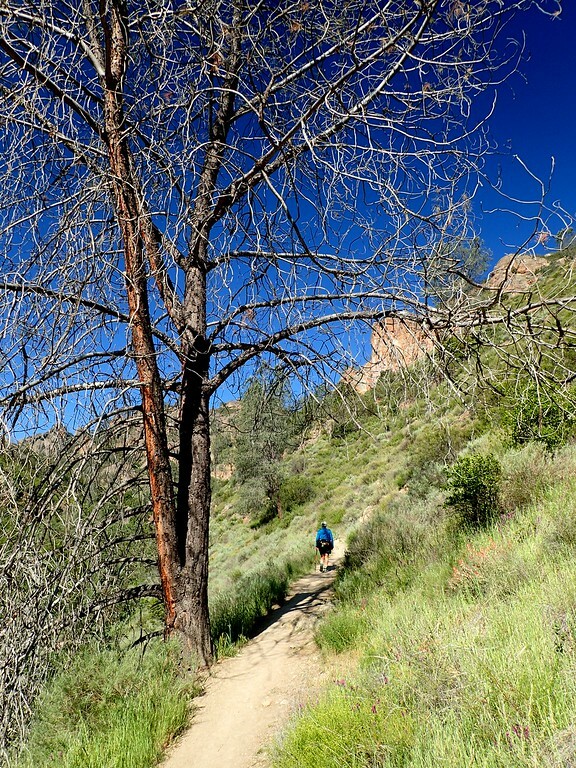 Since we were here early in what had been a wet year, we decided to leave the High Peaks Trail and take the Rim Trail over to see what Bear Gulch Reservoir looked like. As we suspected, it was full. 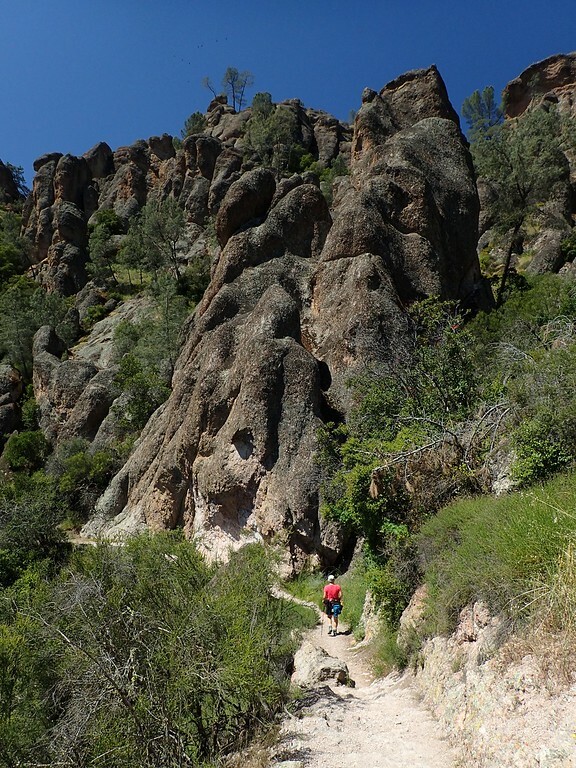 From the reservoir, we took the Bear Gulch Cave Trail down some narrow steps into the “caves” – formed by collapsing talus blocks and not the erosive action of water like limestone caves. 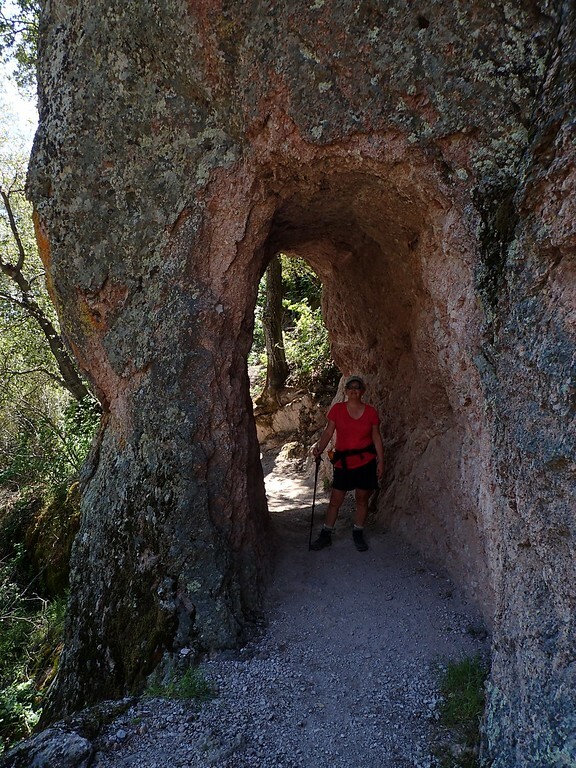 By the time we reached the caves, many other hikers were coming into them from the upper Bear Gulch trailhead, which is less than a mile away. So it was getting crowded and noisy. 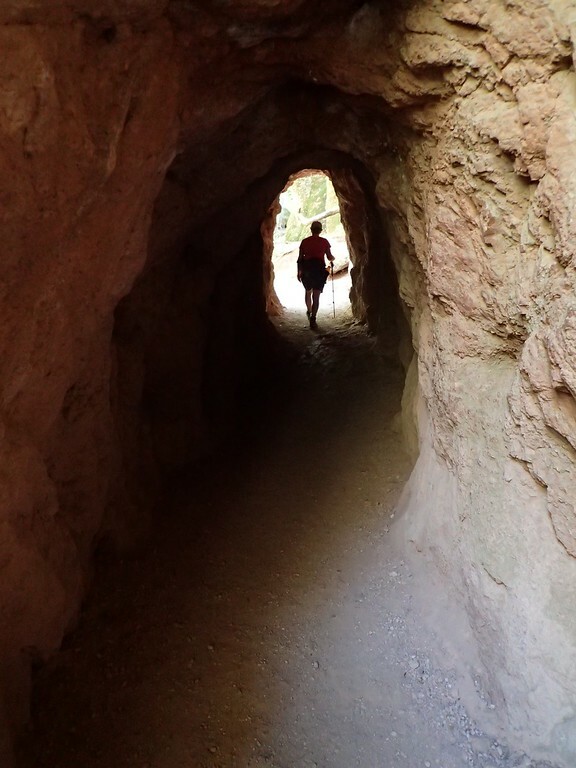 So after banging around in the dark for a short while, we climbed out of the caves on to the Moses Spring Trail and took that back to the trailhead at Bear Gulch. 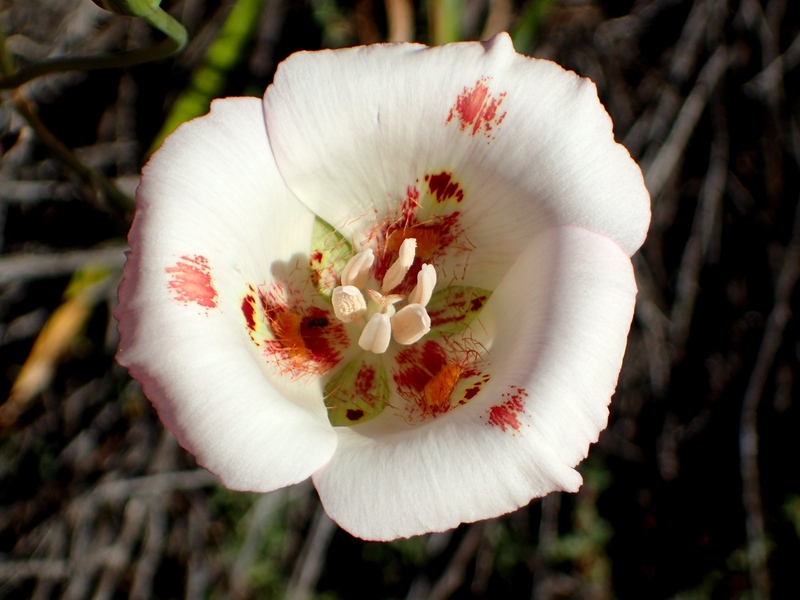 When we got back, both the upper and lower Bear Gulch parking areas were full, and people were circling for a parking space like great white sharks. Our early start was worth it. 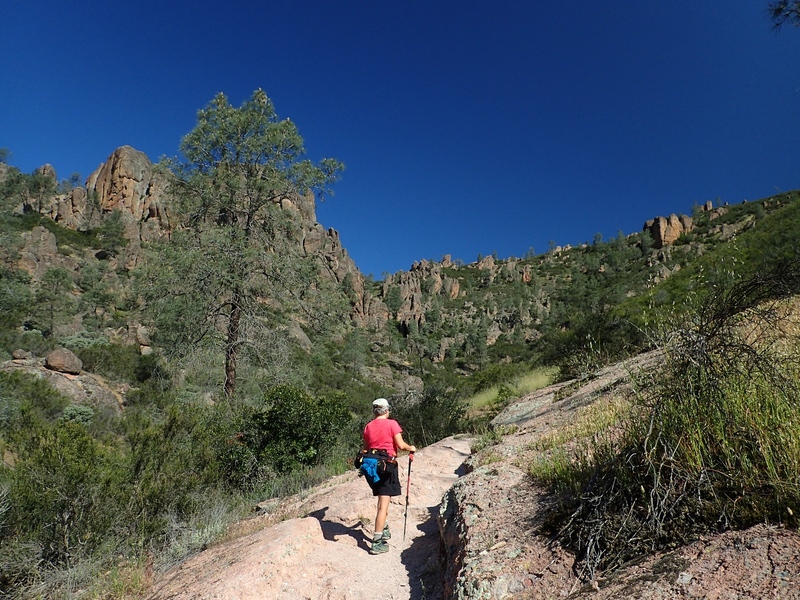 This was a moderate (6.2 miles round-trip; 1,900 feet of elevation gain) loop hike through stunning terrain on a near perfect weather day. 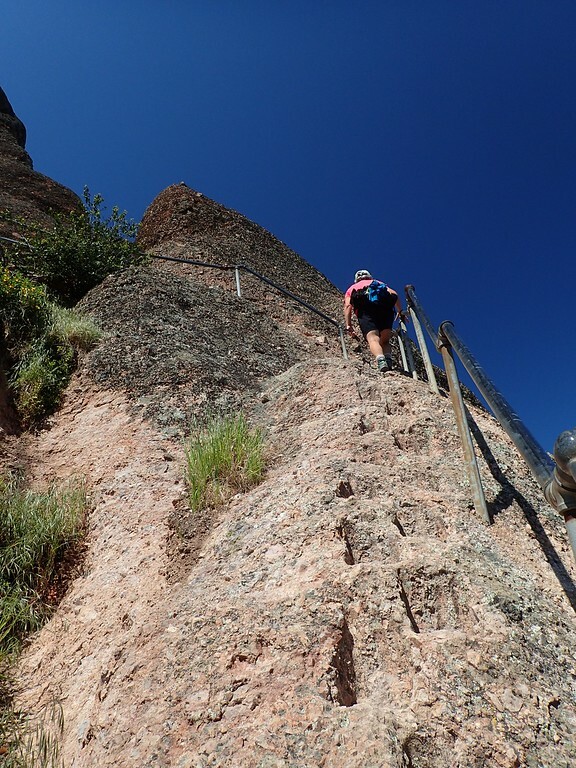 The scramble along the CCC stairs and railings was the high point (literally and figuratively) of the day – highly recommended! 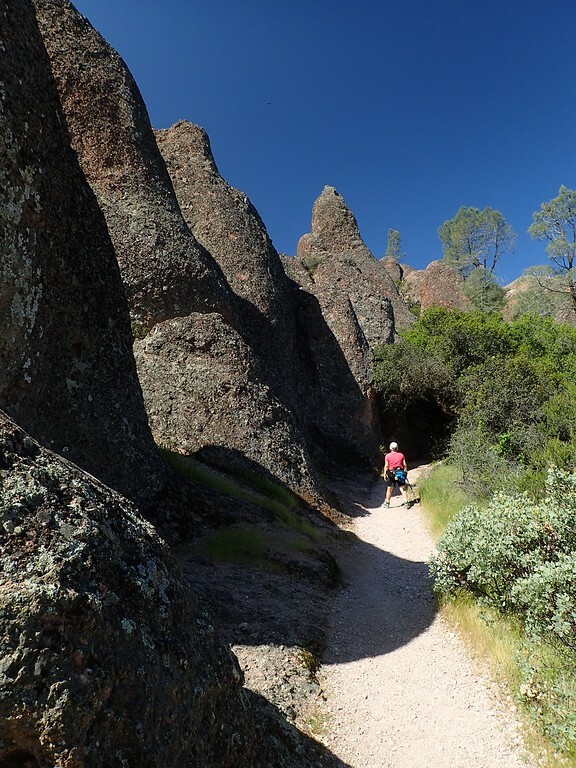 Because the chance for another visit may (or may not) come our way in the future, it was wonderful to have this particular opportunity to finally visit the east side of Pinnacles, do one of the Park’s classic hikes, and revive a few rock climbing memories. 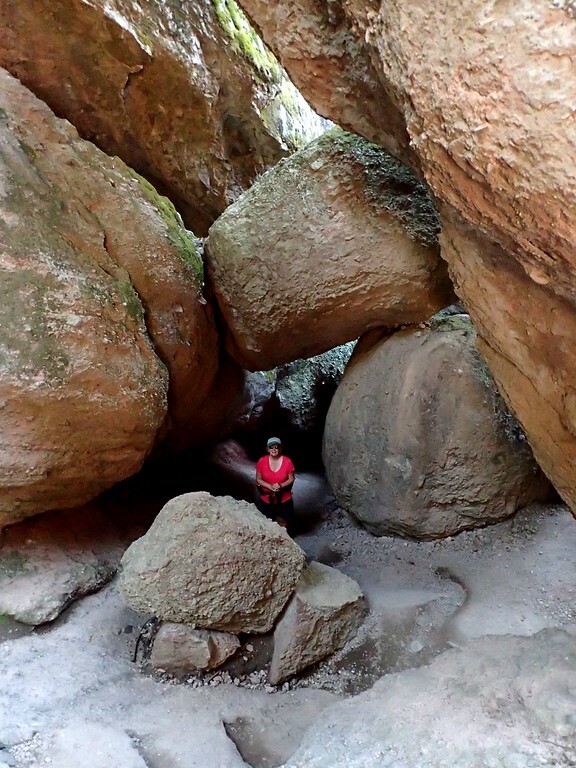 Ok, now you’ve done it…..we want to do this hike. Never been to this National Park. 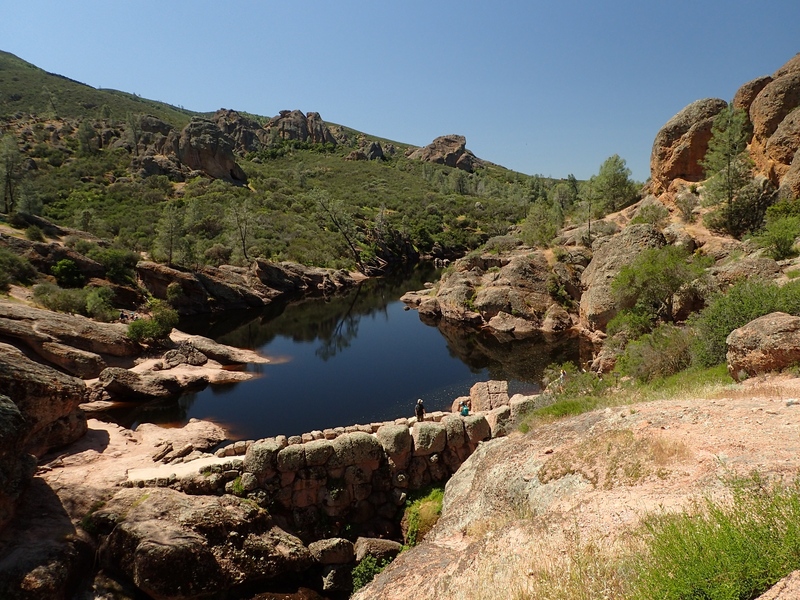 Beautiful and interesting hike and only 6.2 miles. Wow! 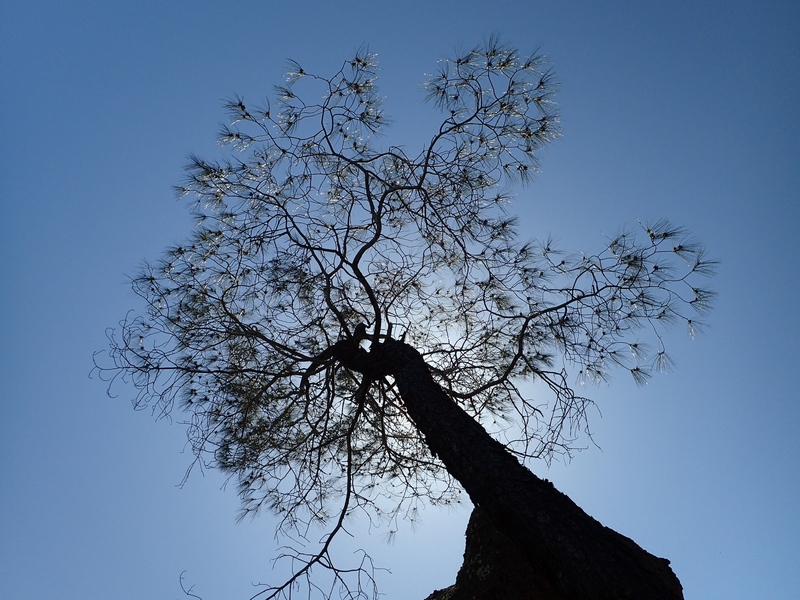 Go in the Spring (Feb-May) or it will be hot. 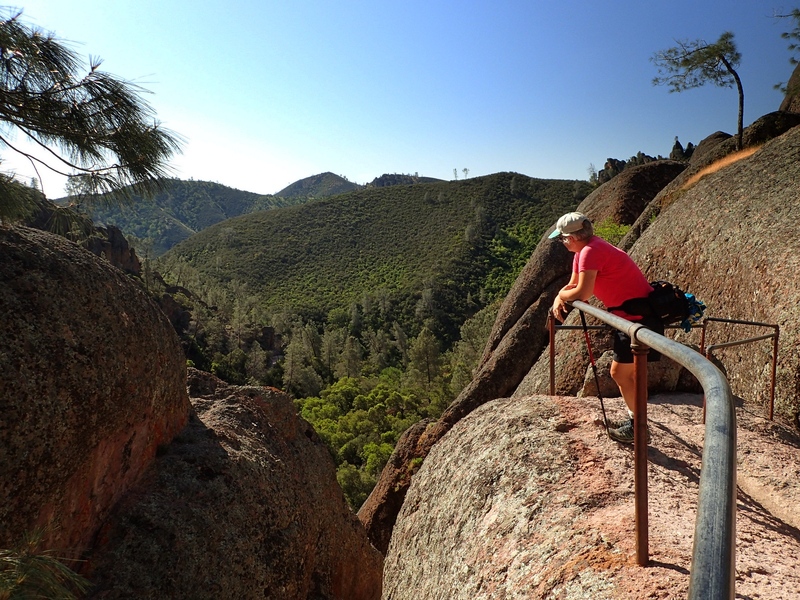 I’d also suggest you fit in a visit to Henry Coe State Park.